Denial comes in many forms. Faced with unimpeachable evidence that something’s the case, there are any number of reasons why people refuse to believe it. For some, it’s an honest mistake. People can convince themselves that the evidence must be wrong. Pride can lead people into mental cul-de-sacs in which they convince themselves that black is white long after it’s obvious that it’s not. I’ve gone down that path more than once myself. Sometimes people become so fired up in their disbelief that they join forces with others in a campaign to discredit the evidence. This is where things begin to get complicated. There can be as many motives for a campaign as there are people in it, and not all motives are above board. Sometimes the motives are overtly political. When a politician or a lobbyist is jockeying for a position of advantage, things can get ugly. They get uglier still when the topic is something as potentially threatening and all-embracing as climate change. In the United States, public figures have resorted to bullying and threats to counter those who oppose their campaigns against climate science. “Don’t play footsie with climate change,” warns Tim Phillips from Americans for Prosperity — “we now have an army too”. He’s saying, follow our line or you’ll be in trouble, a threat not to be taken lightly in the land of the free. As I’ve reported before, US politicians who speak out in defence of the science of climate change can as a consequence be frozen out of their party and lose their jobs. Aggression at the level often encountered in the US isn’t really viable in Australian politics — at least not right now. This is why, when Opposition Leader Tony Abbott attacked Australia’s commitment to the UN drive to cut emissions last week, it was done obliquely, from the side. Australia’s decision to join 36 other developed countries in committing to a second round of the Kyoto Protocol from 2015 showed that the Gillard government was “addicted to spending on politically correct causes,” he said. Abbott got a little singed when he declared climate science to be “crap” back in 2009. He allows us to think he’s since done a 180-degree turn; hence his “determination” to reduce emissions. Such statements ooze insincerity. His demeanour and his past record say something else entirely. Tony Abbott doesn’t really give a damn about cutting emissions, because he doesn’t believe the science that says it’s necessary. That’s why he has effectively renounced the government’s Kyoto commitment, and why he doesn’t bother to address the giant holes in his “direct action” policy. By contrast Greg Hunt, Abbott’s climate spokesperson, understands the science of global warming, and knows that effective action involves hard decisions. But being a loyal party man, he stands foursquare behind his leader — not the best place to be when the leader is backing out of Kyoto. 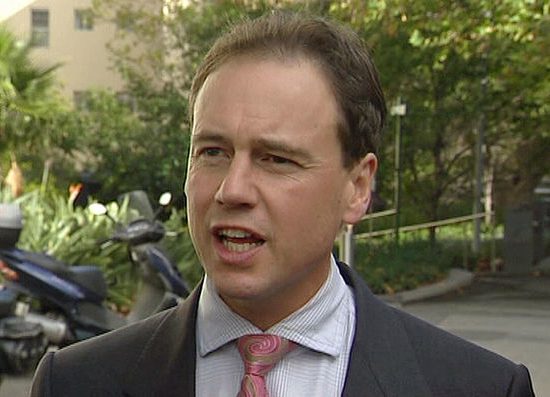 Hunt’s career path requires him, in effect, to talk down the significance of the science behind global warming and the gravity of our emissions trajectory, to give today’s financial accounts precedence over tomorrow’s environmental ones. Such is the public face of climate denial. Denial in the corporate world takes on a more pernicious form. Last week the not-for-profit Asset Owners Disclosure Project released some discomfiting results from a survey of the world’s largest retirement funds, insurance companies and sovereign wealth funds. The AODP chairman, John Hewson, shares with Abbott the distinction of having led the federal Liberal Party, but on climate policy they’re at opposite poles. Hewson rightly sees the investment decisions of funds managers as being “critical to a safe climate and our future prosperity”. Of the 1000 funds around the world that it approached for information on how they managed future climate risk, AODP got responses from only 300. The responses that did come back, Hewson said, presented “a disturbing overall picture of greenwash and reckless mismanagement”. Australia’s biggest fund, the $80 billion Future Fund, was one of those that didn’t respond. Will Hetherton, the fund’s head of public affairs, said his organisation viewed climate change “very seriously”, but decided that responding to the AODP survey “wasn’t going to be valuable”. This might be unremarkable except that until his retirement early this year the Future Fund’s inaugural chair was former Commonwealth Bank CEO David Murray, who several times has said on record that climate scientists are wrong and emissions-reduction measures are a waste of time. It may take many years to turn around a ship the size of the Future Fund. Coming from the big corporate string-pullers, the behind-the-scenes controllers of our present and future wealth, it’s this kind of denial that we have most to fear. • CLIMATE Futures for Tasmania, based at the Antarctic Climate and Ecosystems CRC, Hobart, has won the 2012 Resilient Australia Award for its world-leading modelling of the ways that climate change will affect Tasmania’s weather, water catchments and agriculture through to 2100. This entry was posted in Australian politics, business interests, carbon, carbon emissions and targets, climate politics, contrarians, fossil fuels, international politics, leadership and tagged Americans for Prosperity, Antarctic Climate and Ecosystems CRC, AODP, Asset Owners Disclosure Project, Australian politics, business interests, carbon, carbon emissions and targets, Climate Futures for Tasmania, climate politics, contrarians, David Murray, fossil fuels, Future Fund, Greg Combet, Greg Hunt, international politics, John Hewson, Julia Gillard, leadership, Resilient Australia Award, Tim Phillips, Tony Abbott, Will Hetherton. Bookmark the permalink.